Saunders Sacroiliac Belt and Stabilization Pad (pad sold separately). Most SI belts work fine – as long as the patient doesn’t move! Our unique belt surface has solved the problem of SI belts riding up with patient activity. 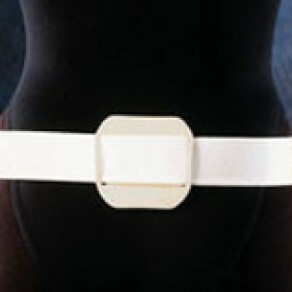 Also, the belt is easy to self-tighten because it’s semi-elastic. It conforms to the natural contours of the pelvis while still providing the rigid support the sacroiliac joint needs. Features comfortable, plush feel; optional stabilization pad for extra proprioception on the sacrum.